New Directions Publishing Corporation, 9780811220637, 190pp. 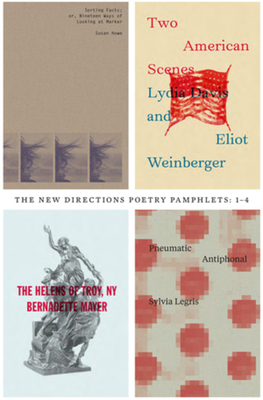 The first four collections in our revitalized Poetry Pamphlet series, established to highlight original work from writers around the world as well as forgotten treasures lost in the cracks of literary history. Included are: Two American Scenes: Our Village & A Journey on the Colorado River, by Lydia Davis and Eliot Weinberger; Sorting Facts, or Nineteen Ways of Looking at Chris Marker, by Susan Howe; The Helens of Troy, New York, by Bernadette Mayer; and Pneumatic Antiphonal, by Sylvia Legris.